Ahh Fridays! 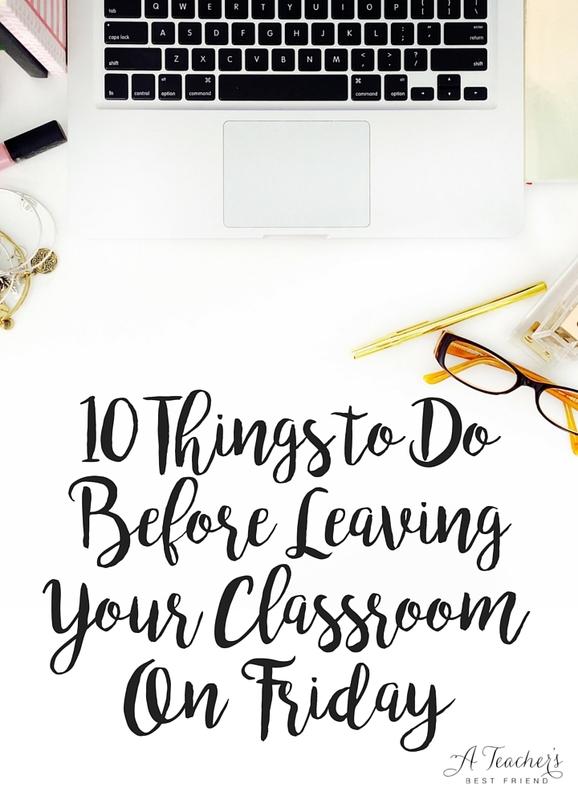 We wait for them all week, and get so anxious to leave school and focus on the weekend, that sometimes we leave and admittedly just say, “Whatever, I’ll do it Monday!” But here are ten things you can do before leaving your classroom on Friday (don’t worry – they don’t take much time) to set yourself up for success on Monday. Write a list as long as you’d like of things you are grateful for from the week. From a few extra minutes to grab a Starbucks on the way to school on Thursday to a sweet note from a student or a long-coming win with one of your kiddos… cherishing those positive moments from our week instead of escaping into our weekend will yield so much joy. It’s also a secret weapon against the Sunday night blues. You can look at your list on Sunday night and focus yourself on the impact you are making. Now #1 and #2 go hand in hand because as you are reflecting on the positive things you are grateful for, also make note of things that went well with lessons and areas where you want to improve for next year. Once we move on to our next week, we usually don’t return to make those notes. Make them while they are fresh in your mind. I just do them on sticky notes and stick them in my file or my curriculum guide so I see them next year. Once you’ve made your reflective notes, take a few moments to file those folders or binders away in your organization system so that they don’t just pile and clutter up your work area. You’ll feel more “done” and ready to move forward with the next week. 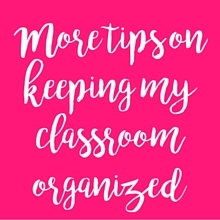 This includes straightening up, washing down the white board, reorganizing things that got messy during the week, sharpening your pencils, etc. Whatever makes you feel happy to have cleaned and done when you walk into your room monday, do it now. It will set a better tone for Monday morning. But here’s a tip – put a timer on for 15 minutes and try to race to get it all done in that time. Lord knows we could stay stuck on this step for an hour or more each Friday. This is also a great one to get students to help with on Friday afternoon. This is a fun one – if you’ve planned for Monday (which is definitely good practice so you’re not doing so much on the weekend) – get your room all ready for it before you walk out the door Friday. This means writing the schedule and objectives on the board, making all of your copies, prepping your materials, pulling curriculum resources that you’ll need to reference, etc. Set them all out ready to go so when you walk in Monday morning you are all set! Often times we wait to start thinking about next week until Sunday night. But a few intentional minutes jotting down your goals for the coming week will help you prioritize and will take that burden off of your entire weekend. You’re set and ready to go mentally for next week and now can relax and enjoy your down time on the weekend. 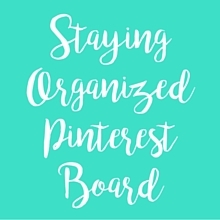 Here is a great (free) weekly organizer from Brooke Brown that I love! I am a fan of daily to do lists in a planner rather than to-do lists on pieces of paper or just one long to-do list. A daily to-do list located in a planner – like the Day Designer pages (FREE) – can be organized on Friday for the coming week so that you have your to-do lists prepped and begun. For example, if you know you need to call a parent, you can place it on your to-do list for Monday so you don’t forget but it’s not staring you down all weekend. When I know I won’t get an item done, I immediately move it to the to-do list for a day or two in the future to get it off of my mind. Take a moment to plan out anything you know you’ll need to do for the coming week and write it on the appropriate day’s list. Take 15 minutes to clean out your cluttered inbox and your computer’s desktop. I don’t know about you but I save things to my desktop throughout the week for easy access. I use these few minutes to clean up that desktop and file things where I want them. I also go through all my emails, skim articles I never got to read, write down items to-do into my next week’s to-do list, or file emails to save. My goal is to empty my inbox. One tool I use is Unroll.Me – a free email organizer that can help you declutter your inbox and push all of your subscriptions etc. into one daily email. Lifesaver!! Try to take as little home with you to do as possible. The weekends are for recharging. But what you do pack in your bag to take home, be intentional with it. There have been so many times I’ve loaded up my bag (or rolling cart – yep that’s right – no shame) to the BRIM with my best intentions, only to have it sit and stare at me all weekend. I lugged it back to school feeling defeated and behind before the week even began. Give yourself grace. And be realistic. Better to be honest than to feel pressure and shame at the end of the weekend. Ain’t nobody got time to be sick. 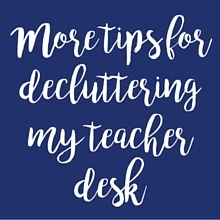 Last step of the day is decluttering your desk and wiping it down with a clorox wipe. Wipe your computer keyboard (once it’s turned off), your mouse, and of course the surface. I also like to give the drawer pulls and any lamp switches etc. a wiping too. File papers that need to be filed and relocate folders and other clutter to their homes. A clean desk is one of the greatest Monday morning gifts you can give yourself. Ten steps may seem like a lot, but challenge yourself to get them done within 1 – 1.5 hours after the school bell rings. (This may mean locking your door so that other people think you are already gone! hehe) Be intentional, focused, and purposeful so that you can relax and recharge over the weekend.